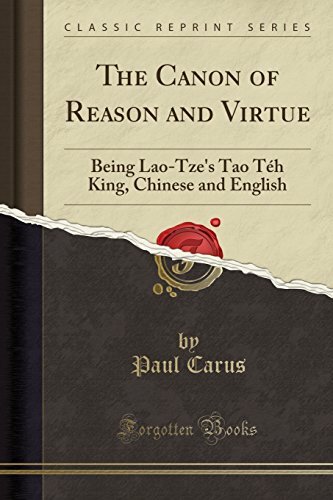 Excerpt from The Canon of Reason and Virtue: Being Lao-Tze's Tao T&eacute;h King, Chinese and English<br /><br />This booklet, The Canon of Reason and Virtue, is an extract from the author's larger work, Lao-Tze's Tao Teh King, and has been published for the purpose of making our reading public more familiar with that grand and imposing figure Li Er, who was honored with the posthumous title Poh-Yang, i. e., Prince Positive (representing the male or strong principle); but whom his countrymen simply call Lao-tze, the Old Philosopher.<br /><br />Sze-Ma Ch'ien, the Herodotus of China, who lived about 136-85 B.C., has left a short sketch of Lao-tze's life in his Shi Ki (Historical Records) which is here prefixed as the most ancient and only well-attested account to be had of the Old Philosopher.<br /><br />Born in 604 B.C., Lao-tze was by about half a century the senior of Confucius. He must have attained great fame during his life, for Confucius is reported to have sought an interview with him. But the two greatest sages of China did not understand each other, and they parted mutually disappointed.<br /><br />About the Publisher<br /><br />Forgotten Books publishes hundreds of thousands of rare and classic books. Find more at www.forgottenbooks.com<br /><br />This book is a reproduction of an important historical work. Forgotten Books uses state-of-the-art technology to digitally reconstruct the work, preserving the original format whilst repairing imperfections present in the aged copy. In rare cases, an imperfection in the original, such as a blemish or missing page, may be replicated in our edition. We do, however, repair the vast majority of imperfections successfully; any imperfections that remain are intentionally left to preserve the state of such historical works.